The problem was that we had to venture past the sign that said “end of trail,” which now, as a parent, takes on a different meaning then when you’re a wild kid. “End of trail” as a child fills you with rambunctious spirit. “End of trail” as a mother fills you with worry and fear that danger and certain death loom just past the sign. 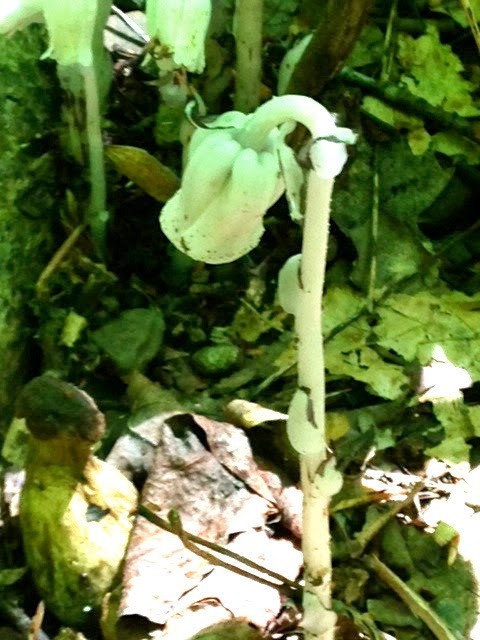 But there are things you learn when you’re on the trail, deep in the sweet old woods of northeastern Ohio. Life lessons that can’t be found just anywhere. There is also a totally awesome waterfall, as memory served. There are two ways to proceed on a trail when you have a very specific destination, and I admit I can barely walk anywhere without a very special children’s book that rolls through my mind with every step. It is a story about two bears who are both headed to the same place, but one bear chooses to earn money for a fast train ride and the other bear chooses to walk the long distance by foot. An honest race, the train-riding bear spends his time scrubbing floors and picking weeds and eventually takes the speedy train. The walking bear ambles through the countryside, watches a snake, takes a swim, eats some berries, and by the time he gets to the destination, his friend has already beaten him. The walking bear simply smiles and says that he would have been there sooner, but he stopped for blackberries. He is the obvious true winner. There were pools of water for stone skipping and hunts for crayfish. We marveled at a field of wet muck covered in skunk cabbage and for a solid minute we laughed at losing shoes in Ohio’s quicksand. Rock ledges and slippery shale in the creek bed made for careful and leisurely steps but with the stops of sunlight to refuel us, we finally made it to the falls. They were still there, some twenty years later thanks to the slow moving time life of our good rocks. 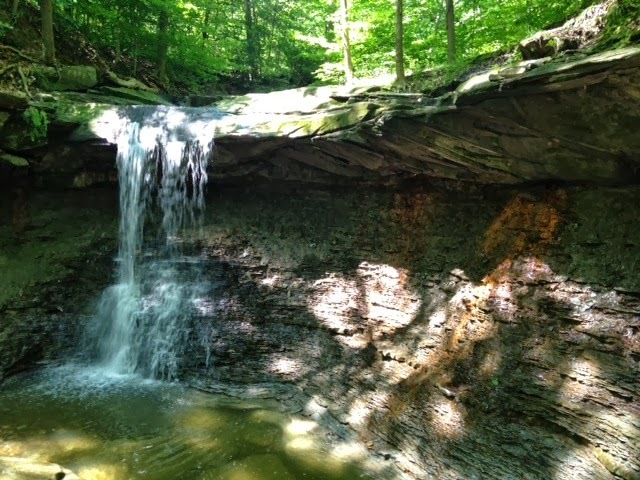 A cascading flow of water down a slope of shale that ended in a pool where I once sat with good friends, talked about our futures and contemplated the very meaning of life. Once my kids and I were thoroughly wet, we headed back with me bringing up the rear instead of taking the lead. When you backtrack on a trail, it’s always surprising what you see when you are walking the other way, because even if you think you saw it all, you haven’t. “Mom! Look!” I heard and my son had found a tremendous set of mushrooms. “And there! Indian Pipe!” my oldest daughter said, pointing out my favorite non-green plant. Just a few hundred feet up the trail, my youngest daughter stopped us all dead in our tracks. 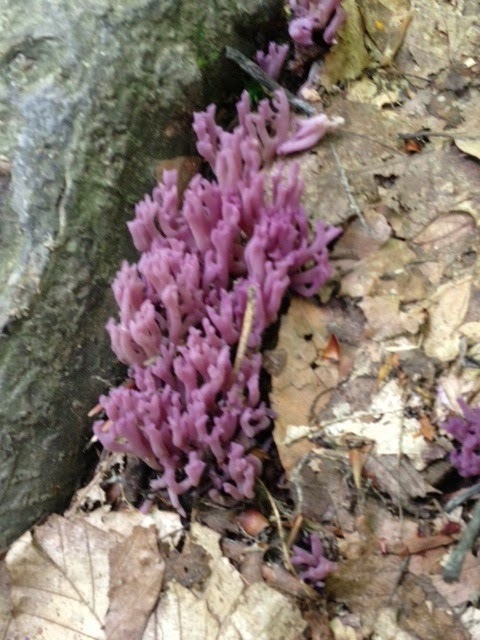 “Purple coral!” she said, finding yet another amazing fungus. None of their finds were edible, but in our own way we stopped for blackberries. I couldn’t help but think that the bear in the book would have been almost as proud as I was. I can only wonder what they will find when they pass the “end of trail” sign twenty years down the road. Normally I like to feed my family healthy, fresh food. In the summer when local produce is bountiful and beautiful, there is nothing better that the smell of a red, ripe tomato so fresh off the vine and into the store and then onto our plates. And with the unstructured schedule of summer break, there is actual time in the day to prepare gorgeous salads that require tedious chopping and an abundance of ingredients. I love all of that. The food, the time, the preparation, and most of all, I love the eating. In my dreamland, it would happen every single day. We would saunter up to the market and handpick the greenest of beans and the reddest of watermelons. Each child would have a nutritious recipe to prepare and a smile on his or her face as they watched their food take shape from the beginning to the very end, where they would all devour their creations. I finally get them all organized and dressed and remind them that they have to wear shoes in public places and by the time we actually get to the store, I am so flustered that I have left my organized list at home. Once we have dodged the dangers of trying to maneuver three kids who aren’t paying attention through a parking lot, we enter and I quietly remind them to please not take up the entire aisle and that they may not all stand on the front of the cart so I can take them on a joyride through the freezer section. They politely don’t listen to a word I’m saying and immediately start asking for snacks and fighting over who gets to pick out the ice cream, which I’m pretty sure wasn’t on the list. My dear husband doesn’t quite understand what it’s like to shop with the kids. The best way I can describe it is that it’s like instead of children, they are actually three tiny little birds. They are all sitting on your nose and no matter what you do or how many times you plead, they just peck away and inevitably drive you completely bonkers. It’s not like they are trying to make you mad, they are just birds. Cute little birds that do what birds do best and that can’t help the fact that they were drug along to the store. Tomorrow’s dinner: mystery freezer baggie. This was logic I could appreciate. I hate making the bed. It is the most worthless chore I have ever encountered, and I have encountered quite a few. I know it doesn’t take long, and my husband assures me he appreciates getting into a neatly made bed at night. I can’t see the value in it, but that’s probably because my eyes are usually closed midair on the way to the pillow. So unless he makes it, or we are expecting house guests who might wander past my bedroom door, my bed is forever unmade. And as another wise friend recently told me, I am doing a noble thing by having unkempt bedrooms. I am protecting my family from asthma and allergens. He referenced a study done by Kingston University a few years back that reports that having unmade beds can actually make you healthier. 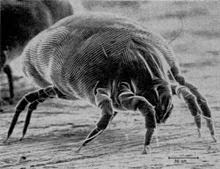 The study states that it all has to do with dust mites, these really itty bitty disgusting little creatures that feed on the flakes of human skin that accumulate in bed sheets, which is a fact gross enough to make us all go and wash our sheets immediately, even my old friend. These little critters with their ferocious looking body parts don’t really need to drink any water—they just absorb the moisture from the air through their bodies. When we make our beds, we are trapping tiny bits of moisture underneath those covers and (gulp) inside those flakes of human skin. That lovely humid environment that we created as we tucked in those covers is like a haven for the dust mites, a cozy place where they have all of the moisture and skin they need to live and reproduce. Then they gather and have little dust mite parties and when we slip in between the sheets, we are absolutely not invited. But we deal with its aftermath, which they report as asthma and allergies caused by those little dudes not cleaning up from their merrymakings and inviting their friends to live with them. Forever. The study continues that if we simply leave our beds unmade, we can prevent these creepy celebrations. When we leave the covers off, there’s no trapped moisture and even those delicious, delectable bits of skin blow away making a very inhospitable place for the mites. Dead skin aside, I think that’s all the fodder I need to further my argument for not making the bed, and if my old friend should ever be visiting and have a comment about the blankets piled up at the foot, I will be ready to aim and fire with the apparent scientific cause as to why my sleeping place is in shambles. I will, however, go on to explain that the sheets are clean. Very clean. Skin free and laundered regularly with all of my bath towels. I have kids. I work with kids. And keeping those factors in mind, there is a very good chance that at any given moment, some sort of dried up food or bodily fluid is going to present on their hands. These mystery substances are the little beauties that carry germs that make us sick and when you run as fast as I do, we just don’t have time for that sort of stuff. It then follows that we are ardent hand washers. Like, big time. Come home from somewhere? Wash your hands. Eating? Wash your hands. Bathroom? In a public place? Wash your hands and don’t touch the doorknob on the way out. Call me a germaphobe, but some things are just good, solid personal hygiene. And there’s nothing wrong with that. One recent morning I was listening to the morning news and they announced a study done by Michigan State that reported that 95% of people don’t correctly wash their hands. 95%. That’s a lot of dried up yuck on doorknobs. “That’s ludicrous,” I said outloud, as I lathered up my fingers. But there I was, later that day in the library bathroom. The other stall was occupied and she finished up before me. 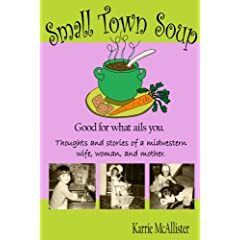 I listened as the person flushed, open the stall door, and completely bypassed the sink and walked right out the door, probably to thumb through the book I would eventually check out. She didn’t wash her hands! Maybe there was merit to this study after all. So I looked it up and found that their results are pretty filthy. The study followed 3,749 people. Of those people, over 10% of them (including my library friend) didn’t wash their hands at all. Over 22% simply wet their hands without using soap, and the remaining 67% actually took the time to apply soap, lather, and rinse their germs down the drain instead of sharing them with the rest of the world. The study then goes on to report the correct method for washing your hands according to the CDC. They recommend using soap and rubbing your bubbly hands thoroughly for 15 to 20 seconds, approximately the time it takes to sing “Happy Birthday” through two times. The CDC stands firm in its statement that proper hand washing is the best way to fight spreading illness and to keep you healthy. The study done at Michigan State sadly reports that given these standards, only a measly 5% of people actually took the time to correctly wash their hands by using soap for 15 seconds and drying them appropriately. That means that only one out of every twenty people gets the yuck off. As a germophobe who swears that touching an unwiped shopping cart gives certain pink eye or stomach virus, this is downright disgusting. I certainly am not expecting every person in the world to belt out “Happy Birthday” at the bathroom sink, but I would really entertain the idea of a bit of peer pressure at the sink. We do it all the time when we’re driving—a simple honk of the horn to let our fellow drivers know that something they are doing isn’t quite right and isn’t quite safe. 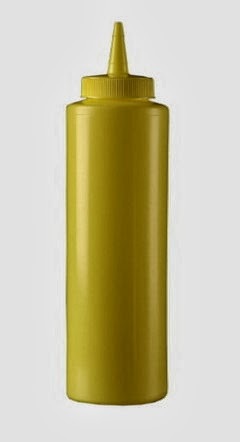 Perhaps they could be located next to the towel racks or electronic blowers, and if someone tries to skimp on the soap or, my word, just walk out without even a drop of water, we could just honk at them. Maybe even yell out “didn’t wash hands! Didn’t wash hands!” to evoke humiliation and certain scrubbing. Of course, before touching the horn, please take the time to disinfect yourself correctly, like the other 5% of the population. Chances are we’re the only ones who will use the horn and we prefer germ free honking devices.